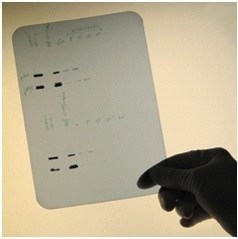 Why spend several hundred euros on film for Western blots? 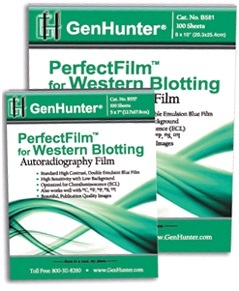 GenHunter's PerfectFilm is a high-quality, especially sensitive blue autoradiography film that is ideal for most applications including Western blots using ECL substrates for HRP or AP! Equivalent film cheaper than competitors! With tight budgets in these difficult economic times, every lab needs to be price conscious. Our PerfectFilm has excellent contrast with low background and is coated on both sides for improved consistency and overall performance. It produces sharp, bright, publication-quality images and is ideal for most applications including Western blots using ECL substrates for horseradish peroxidase (HRP) or alkaline phosphatase (AP). It is compatible with manual or automatic processing methods and can be used with calcium tungstate or blue-emitting rare-earth screens. Differential Display kits, reagents, PerfectWestern® containers and consumables. GenHunter was founded in 1992, the year when differential display was invented, to provide the biomedical research community easy access to the technology. With expert experiences from the inventor, GenHunter Corporation continues to improve, streamline and perfect a complete line of research products centered around the mRNA Differential Display technology. GenHunter Corporation has been the exclusive licensee for the manufacturing and marketing of differential display reagent business. Intensive research and development, highest quality assurance, and expert technical support have made GenHunter the world leader in differential display technology.